I’ve taken so long for a little update… there was lots of work and more coming up. 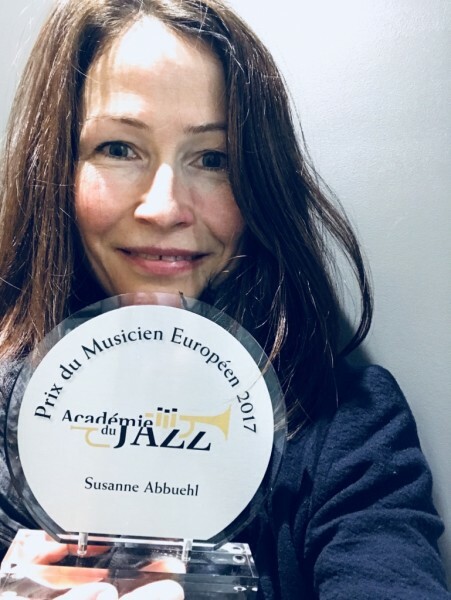 A very special day happened last Sunday in Paris, where I won the „European Musician 2017“ award from the prestigious Académie du Jazz. I’ve won several prizes and awards over the years*, but this one made me very happy. Very grateful to the wonderful group of people who have helped me realize my work and whom I’ve been collaborating with, in most cases, for many years. Not that working together for a long time is a value in itself – but it might be a marker for a way of collaborating that acknowledges the importance of everyone involved. Many thanks to all the Academy members and to the French press and media that so many times succeeded in expressing with words what this music is and can be. A very big thank you to ECM founder and producer Manfred Eicher (and everyone at ECM Records) who has given me the chance to develop and grow as a musician and whom I am continuing to learn from. In 2000, I was one of the first after just a handful of other Swiss to record for ECM as a leader, and I was the first Dutch to do so. As an artist you need people who give you a chance before you have credentials, and Manfred was one of these persons for me. As in a dream, and by miracle, all the musicians of my main projects at the moment could be in Paris on Sunday: A big big thank you to Wolfert Brederode, Matthieu Michel, Øyvind Hegg-Lunde, Stephan Oliva and Boris Darley as well as to Tijmen Zinkhaan. Many thanks also to my agent Simon Barreau and to Marie-Claude Nouy who was very instrumental in launching this intimate and breakable chamber jazz of mine in France back in 2001, and who is now Vision Fugitive’s label manager – the French label that released Stephan Oliva/Susanne Abbuehl/Øyvind Hegg-Lunde’s „Princess“ last year and that I was happy to be part of. Thanks again also to the Swiss Embassy in Paris, Ambassador M. Regazzoni and cultural attachée Mrs Scharf. BIG THANK YOUS to our listeners from near and far and to colleagues and students who inspire me with their talent and creativity.